The Ohio State University Board of Trustees approved on Friday $3 million for design of a building that will help anchor an envisioned innovation district in the university’s west campus. The Energy Advancement and Innovation Center will be a hub where Ohio State faculty members, students, alumni, ENGIE researchers, local entrepreneurs and industry experts work together on the next generation of smart energy systems, renewable energy and green mobility solutions. The university was granted approval for $3 million for professional services for the Energy Advancement and Innovation Center, which will serve as a hub for technology commercialization first outlined in the university’s comprehensive energy management partnership. The project is a cornerstone of the university’s public-private partnership with Ohio State Energy Partners (OSEP). As part of the agreement, OSEP committed $50 million for the project, including $35 million in design and construction costs. “We are very excited to be moving into the design phase of this watershed project which is one of the cornerstones of our long-term partnership with Ohio State, and as a fellow Buckeye, I feel very lucky to be a part of the development of the innovation district,” said Serdar Tufekci, CEO of OSEP. The Visionary Project Advisory Committee was formed early in the conceptual stages to guide the university in the governance of center. Jay Sayre, who serves as Assistant Vice President in the Office of Research and Director of Innovation in the Institute for Materials Research, chairs the committee, which is comprised of Ohio State, OSEP, and Columbus community members. The Institute for Materials Research (IMR) welcomed some of the newest faculty members to join The Ohio State University community through the Materials and Manufacturing for Sustainability (M&MS) focus area of the Discovery Themes Initiative. New faculty members briefly presented their research goals on Sept. 20 at this year’s annual M&MS Faculty Fall Social, held at IMR’s Innovation Lab at Nanotech West Laboratory on Kinnear Road. The event also gave faculty a chance to socialize and share research interests in a less formal setting. Six new hires join 17 faculty members and researchers already working within the M&MS cohort at Ohio State. The M&MS Discovery Theme is a university-wide program operated by IMR that advances and accelerates innovation and materials research in technologies, science and manufacturing, as they apply to future energy systems and sustainability. Some members of the Girl Scouts of Ohio’s Heartland recently explored the science behind sustainable energy with engineering staff and students at The Ohio State University. Girl Scouts attending “Scoping Out Solar Energy” at Ohio State’s Institute for Materials Research (IMR) Nanotech West Lab and Center for Electron Microscopy and Analysis (CEMAS) took part in discussions and hands-on science and technology activities with College of Engineering volunteers. Throughout the day, the nearly 20 Girl Scouts learned about energy use, conversion and storage, as well as energy consumption of electric vehicles. The topics complemented concepts learned in school and introduced them to new ideas regarding renewable energy and electron microscopy. Through each activity, the elementary school-aged girls also had an opportunity to consider their potential roles as science and engineering leaders in the future. The Institute for Materials Research (IMR) welcomed one of its largest gatherings of professors, researchers and visitors to The Ohio State University for its 10th-annual OSU Materials Week. Each spring, students and researchers from within and outside academia around the world share their work at the IMR event. The goal is to encourage interdisciplinary collaboration and celebrate developments in materials-allied research. IMR Executive Director Steven Ringel welcomed several hundred visitors during the May 8 reception at the Blackwell Inn and Conference Center, kicking off four days of activities. “OSU Materials Week is a very special event, as it is both a technical conference in which researchers share the latest in innovative materials-allied research, and a celebration of Ohio State’s material community and all of its accomplishments,” Ringel said. 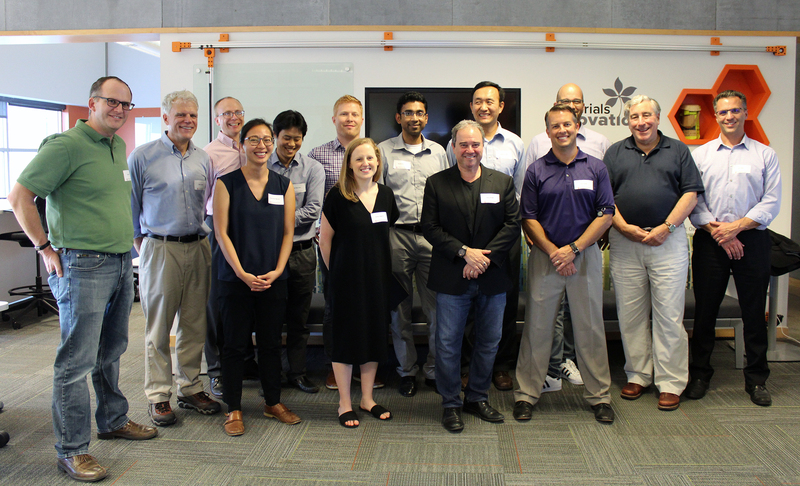 To help integrate new faculty into the materials-allied community, the event featured two days of “cross-cutting sessions” showcasing eight of the newest Materials and Manufacturing faculty members and their work. Each joined the Ohio State this academic year. “With so much breadth and depth within our campus, building a community from our local strengths and interest, and finding a way to enable easy collaboration were the primary reasons IMR started Materials Week from the outset,” Ringel said. Focus Session attendees at GE Additive Materials Development leader Behrang Poorganji’s presentation on metallurgy and additive manufacturing. Three days of “focus sessions” allowed other faculty at Ohio State and researchers outside the university to share their work as well. During these sessions, visitors roam between talks featuring faculty from Ohio State’s Department of Materials Science and Engineering, or Chemistry and Biochemistry to Cornell University, the University of Glasgow, the Walter Reed National Military Medical Center or the Honda Research Institute, to name a few. Ohio State student researchers had a chance to shine during two popular competitions: the Three Minute Thesis (3MT) and Poster Sessions. 3MT challenged five Ohio State students to effectively communicate a distilled, compelling thesis and its significance to an audience outside their specific scholarly focus in three minutes or less. Videos and information about this year’s 3MT presentations are available here. Nearly one hundred Ohio State undergraduate and graduate students shared their work and received feedback from professors and students of varying disciplines during the Poster Sessions, held over two days. Photos and information about Poster Sessions award winners are available here. During the awards ceremony, Ohio State Executive Vice President and Provost Bruce McPheron said IMR helps set an example at Ohio State for working across boundaries in the field of materials research. 3MT winner Brelon May accepts his award from Serdar Tufekci, CEO of 2018 Materials Week sponsor Ohio State Energy Partners. This year’s keynote address was given by renowned professor John A. Rogers, a Northwestern University professor of Materials Science and Engineering, Biomedical Engineering, and Neurological Surgery. Rogers addressed his research of materials for bioresorbable electronics and application examples, including wireless sensors of intracranial temperature, pressure and electrophysiology designed for use in treatment of traumatic brain injury and electrical stimulators for accelerated neuroregeneration. Liang-Shih Fan, professor in the Department of Chemical and Biomolecular Engineering, took home two IMR Innovation Awards: Most Patents Filed and Most Invention Disclosures Filed. Robert J. Lee, professor of pharmaceutics in the College of Pharmacy, also won Most Invention Disclosures Filed. The IMR Distinguished Service Award was given to IMR Executive Assistant Jennifer Donovan in recognition of her sustained outstanding performance in support of the institute’s vision and university’s core values. The 2018 OSU Materials Week was supported by Ohio State Energy Partners (OSEP), a 50-50 joint venture between ENGIE and Axium Infrastructure; the Center for Emergent Materials, an NSF Materials Research Science and Emerging Center; and the Office of Energy and Environment. OSEP is set to offer direct academic collaboration support in a myriad of specific areas, including student financial aid and internships, new faculty positions and the creation of an innovation center on campus. OSEP and IMR collaborated during a February INNOVATE-O-thon event, in which nearly 40 undergraduate students from different disciplinary backgrounds worked together to generate strategies aimed to inspire classmates to alter energy consumption habits and, in turn, improve energy efficiency at the Columbus campus. Robert M. Wallace of the University of Texas at Dallas brought decades of experience in the fields of physics and materials science to students and faculty at The Ohio State University on March 27 during IMR’s annual Distinguished Lecturer Series. Wallace is a renowned professor of Materials Science and Engineering and Erik Jonsson Distinguished Chair in the School of Engineering and Computer Science at UT Dallas. His lecture, “High-K Dielectrics: A Perspective on Applications from Silicon to 2-D Materials,” walked attendees through evolutions and challenges in gate-dielectrics research, from the establishment of Hf-based dielectrics in commercial silicon technology fabrication processes to pushing the limits of channel scaling with atomically thin 2-D materials. “I wanted to try to give a larger perspective of how important materials are and how important interdisciplinary interactions are in doing this kind of work,” Wallace said.